A soprano with very eclectic tastes in music, Maria Karlin has sung for a variety of sacred and secular choral and opera ensembles such as Cappella Romana, Third Angle, Portland Baroque Orchestra, Trinity Consort, Resonance Ensemble, Portland Opera Chorus, and Opera Theater Oregon just to name a few. 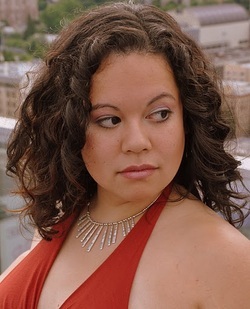 Currently a student of Ms. Nancy Olson-Chatalas, Maria holds a Bachelor of Music degree in Vocal Performance from the University of Oregon where she studied under Dr. Anne Tedards. Ms. Karlin is also a seasoned recording artist, lending her talents to Oregon Catholic Press and Revolver Records as a soloist and ensemble singer. Excited and intrigued by a variety of genres, Ms. Karlin has been recording and/or performing with such local talent as Rachel Taylor Brown, Bryan Free, Jim Brunberg, Holcombe Waller, Buoy LaRue, Portland Cello Project, and "Portland's loudest" psych-rock band: The Pink Snowflakes as well as recording back-up vocals for world renown Joel Gion and Matthew Hollywood of the Brian Jonestown Massacre, and Matthew J. Tow, Australian front man for the Lovetones. Maria is a member of the Portland based Spaghetti-Western band, Federale which toured west coast several times in 2010 promoting their second album, "Devil in a Boot," playing such historic venues as the Fillmore in San Francisco and the Henry Fonda Theater in Los Angeles. Hot off the success of their first venture with Portland's own Filmusik, (a match made in cowboy heaven) Federale has proudly released their long-awaited 3rd album, "The Blood Flowed Like Wine." Their next major project includes scoring the film, "A Girl Walks Home Alone at Night" produced by Elijah Wood's newly formed "Woodshed Productions". Maria was also a performer for the commercial soundtrack for "Half-time in America"-- An Emmy-Nominated Chrysler commercial which aired during the 2012 Superbowl. A founding member of Portland's newest ensemble The Julians, she not only shows off her genre-crossing vocal abilities at every show, but she also contributes original arrangements of songs by such artists as Lykke Li, Lily Allen, and Tom Waits. Ms. Karlin was also the featured soprano soloist in Resonance Ensemble's performance of Igor Stravinsky's ballet, "Les Noces" in April 2011. Maria is ecstatic to lend her talents to further expand Portland's amazing and indescribable musical scene.